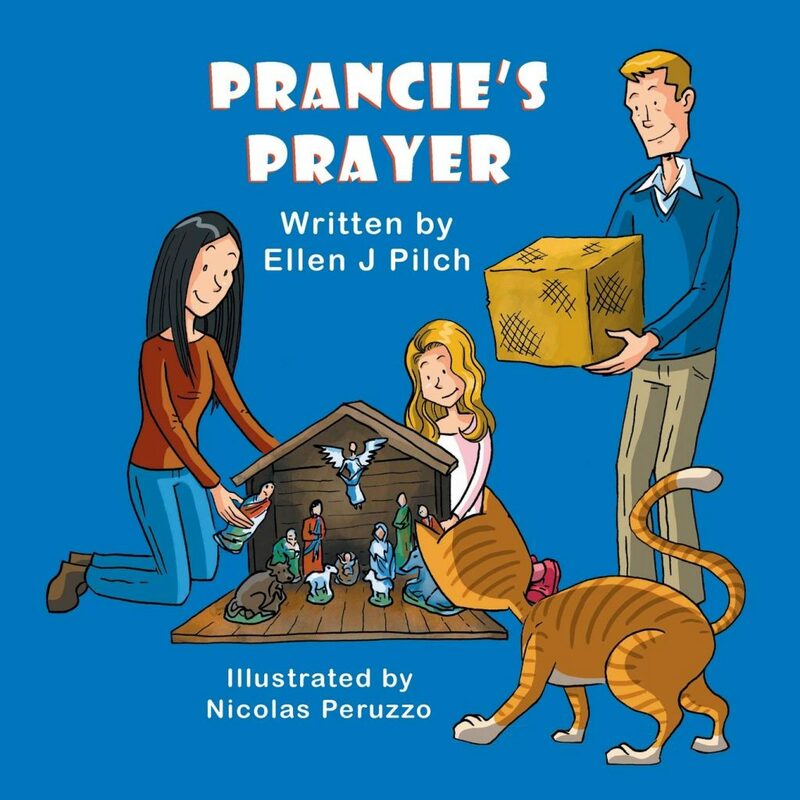 Thanks to the generosity of author Ellen Pilch, royalties of the children’s book “Prancie’s Prayer” will go to Boston’s Forgotten Felines for any book sold (not Kindle version) through December. Below are the links to the book on Amazon and Barnes & Noble for your purchasing convenience. Thank you so much Ellen! We appreciate your kind offer! Prancie’s Prayer is the first picture book written by Ellen J. Pilch and published by Mirror Publishing. It is about an orange cat who finds herself homeless one cold winter. She has trouble finding something to eat and a warm place to sleep, but with a little help from above she finds all of that and more in her wonderful forever home. The story is loosely based on how the author’s cat arrived at her doorstep. You can read more about Prancie and her family at 15andmeowing.com. Buy it on Barnes & Noble. We are pleased to announce two holiday activities at the Prudential Center Mall on Saturday, December 8th. We are partnering with California Pizza Kitchen on a fundraising opportunity! If you eat or drink at California Pizza Kitchen (Prudential Location ONLY) on Saturday, December 8th and mention that you are there for Boston’s Forgotten Felines, they will donate 20% of your bill to Boston’s Forgotten Felines! Eligible purchases include: dine in, take out, catering, and all beverages. Perhaps you work in Boston and can have lunch there that day with co-workers or you can head there after work for an end of the week drink, take out, or eat in for dinner with friends! Please help us spread the word by sharing our Facebook Event! In addition, we have been invited to participate in the 10th Annual 31 Nights of Light event! 31 Nights of Light was created in 2009 as a way to bring awareness to participating non-profit organizations during the month of December. Each night, the top of Prudential Tower is lit a different color in support of that night’s partner. 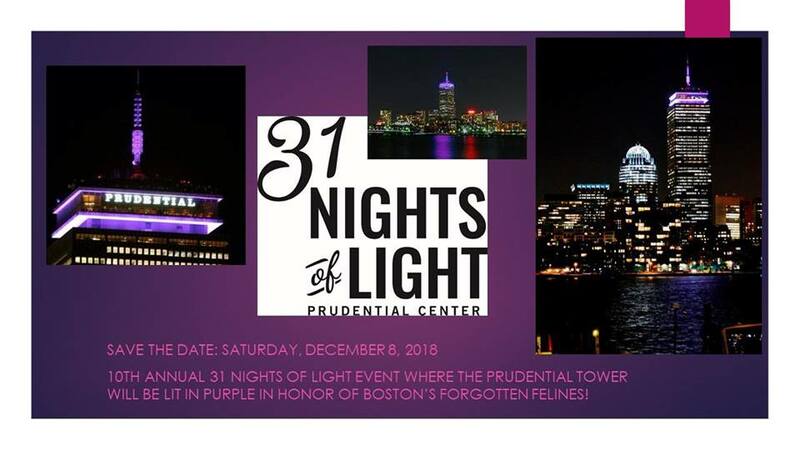 On Saturday, December 8th the Prudential Tower will be lit in purple in honor of Boston’s Forgotten Felines! For more information on the lighting, check out our Facebook event. We hope that many of our volunteers, friends, and donors will participate in the California Pizza Kitchen fundraising opportunity and check out the Prudential Tower lights on Saturday, December 8th in support of Boston’s Forgotten Felines.